I have tested this and it works flawlessly. Just remember to backup the original iCal app (it’s only 42mb) in case you ever want to change back to good old cowhide. Keep in mind that future iCal updates will probably overwrite your changes too. A huge shout out to MacNix for creating the files to replace the UI. If you are not comfortable messing with apps resource contents, MacNix also offers an ‘automatic installer’ version that just writes over the files for you, but you’ll still want to duplicate iCal.app as a backup. Lol indeed Aluminium is Dutch but Aluminum is English isn’t it? US English and British English varies massively in spelling and pronunciation of certain words. The method you use depends on who told you English should you be from a non-English speaking country. It was only a matter of time. Thanks for this. However, I still prefer the old iCal sidebar. This new one makes it tougher to immediately hide and show certain categories. Also, the colours are fainter and the typography is different. Basically they made a bunch of changes that I, for one, don’t enjoy. The new address book is a complete mess. The old one was so much easier where you could easily see three columns: categories, names, and info. Now there’s pages to turn? Cmon. Works fine, make sure to back up the Address Book app before. I can not find how to turn the to-do list on the new iCal. Am I missing something? Did you ever find your old To Do List? I haven’t had time to research this. 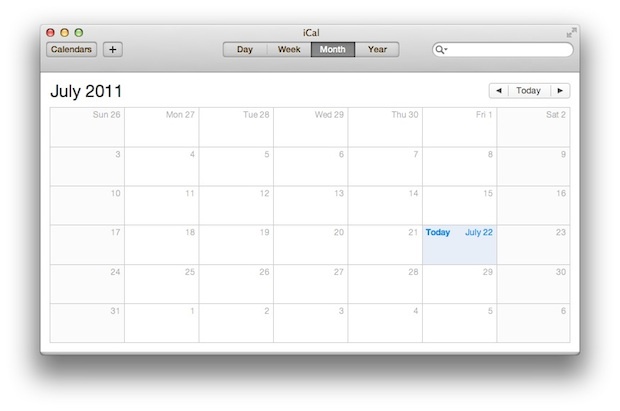 Now if someone can figure a way to show the Calendars, like in Snow Leopard (vs. Lion’s need to click each time in order to see your calendar list), I’ll be fully on with Lion’s iCal. I would love to see this, as well! I’m not a developer, so I’m making a request to the world that this gets created! Thanks. I’m on OSX Snow Leopard and I want this leather skin, Is it possible? please make an article about it. Thanks! The Leather was awful – thank you! Is there a way to change the color of the titles so that they are gray instead of brown? The brown on the aluminum doesn’t look exactly right. I agree – it looks much better it just needs that brown drop shadow changing and its sorted. Oh thank you thank you. That leather look was hideous. thanks mate, exactly what i was looking for. it’s SO DUMB to write ALUMINUM when it’s ALUMINIUM!!! Thanks so much that new look was just not me. It’s like someone got really bored on their cowboy retreat. thanks for the fix – why do Apple think we want to replicate old paper systems on high power computers. Please change this soon, we want the future. Thank you, what a relief not to have to live with someones misguided idea of design. Great tweak. How about a way to change the brown text in the UI to black after this fix? thanks! I did not like the torn off paper pages things – that just annoyed me as I do lots of forward planning back and forth and do not want to see torn off paper pages. Small thing but I like it better this way – seems to me they should offer a few different skins you can switch between. Thanks so much – this was easy to fix with your help. Thanks a lot for correcting this ugly mistake OS X Lion! Anyone else have the files uploaded so that we can download again? Anyone have a solution for getting rid of the animated page flip while in the month view in the new iCal? Can you repost Will? Not available again. Thanks! File not found again – please repost. Thanks! I originally made this fix, I sometimes update the file but you can always find a live copy on macnix.blogspot.com. hey the files for this guide are missing can you repost them…. You can also customize iCal’s look by replacing the “LeatherTile.png” and “LeatherTileFullscreen.png” files in resources, by another texture keeping the same files names and using the “Killall Dock” command in the terminal. Fabulous! Thanks! Lion iCal skin is very irritating. Yes, again, updated link no longer has files. Any chance to update again? looks like link expired again. please re-post. My camel’s back is broken with this hideous design. Making the move to Thunderbird!! I cannot access the file to change my iCal back to the aluminium style in Lion! Where did it go? please repost the link… this horrible skin (and the one from address book) is the only thing keeping me from dumping outlook 2011, so maybe this will finally make it happen. thx! yes please please please re-upload!!!!! Thanks so much for this download- much better! Does anybody know how to make the ‘all-day’ events section larger. I usually have around 10 all day events in my diary and can only see 6 at a time. I can scroll to see the rest, but as I look at my diary all the time, it’s a real pain. Thanks to anybody who can help me! It looks like the replacement aluminum files are no longer hosted at the linked site. Does anyone still have them anywhere? Why can’t they just give you a few options? Not everybody is going to like one or the other….I can change a billion other things on this to make it work the way I want but I can’t choose a different calendar screen without basically going back in time to an older app. Thank you so much! I even stopped using the calendar because the interface got so icky. Thank you for the fix!! !